Privacy breaches and cybersecurity failures are becoming – it pains me to say – all too commonplace. However, that doesn’t mean some of them are not uncommonly strange, involving circumstances so odd they are almost unbelievable. Consider the following tale of two images (which may be worth more than two thousand words for the pair). First, consider the striking image on the left, created last year by ESET for an infographic about the Internet of Things or IoT. In the picture you can see a bunch of different “things” that could potentially be connected to the internet, from an automobile to home appliances, from wearable devices to a teddy bear (and if you think this particular teddy looks a little sinister, that’s thanks to the skill of this particular artist). The infographic itself, to which there is a link at the end of this article, display the results of a survey that ESET carried out last October in conjunction with the National Cyber Security Alliance. The goal was to assess consumer attitudes to the IoT (as you may know, October is National Cybersecurity Awareness Month). 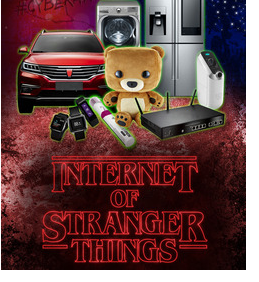 Because the survey results were published later in the month, close to Halloween, and the science fiction-horror series Stranger Things had become quite popular, ESET thought that “Internet of Stranger Things” would be a nice twist to put into the title of the resulting infographic (hence teddy’s intentionally sinister look). Now checkout the image on the right. This is an actual toy, sold in America, that connects to the internet, namely a CloudPet (a brand owned by California-based Spiral Toys). This toy, which can record, send, and receive voice messages over the internet, has been in the news lately, but for all the wrong reasons. In other words, companies who are making internet connected devices are already on notice that there is skepticism and concern about their security and the privacy of personal information that they process. We have seen poor security affecting connected toys before, as in the VTech case. I have previously written about security risks related to wearables and connected/autonomous vehicles. And to say that voice-activated connected devices may cause unexpected side effects is clearly an understatement. What ties all of these things together – besides the internet – is the fact that too many people who make technology are also making poor decisions about technology risks. Those poor decisions lead to problems, not just for the unwitting consumers that buy the poorly secured products, but also for the wider digital ecosystem. Consider the massive Distributed Denial of Service (DDoS) attack on October 21 of last year. That resulted in lost revenue and unbudgeted costs for hundreds of companies, and it was made possible by insecure IoT devices. How long before an attack of this type impacts patient care in the increasingly connected medical world of electronic health records? And when you hear about devices giving up the secrets of their users like these cuddly toys did, you have to ask how long before patient fears around privacy loss due to weak security lead to the rejection of connected monitoring and treatment devices, undermining the much anticipated benefits of telemedicine? That day may come sooner than you think, because as I said, the CloudPets story gets worse. It turns out that, due to design flaws and poor risk assessment, these things can be turned into spying devices, as described in this article and also here. While you could say “they’re just toys,” it is not hard to see that a string of cases like this could seriously undermine the public’s faith in more critical digital technology, an outcome with potentially dire economic consequences. For the full “Internet of Stranger Things” infographic and tips for securing the IoT, click here.